A metal frame is necessary to suspend the vault in the center. 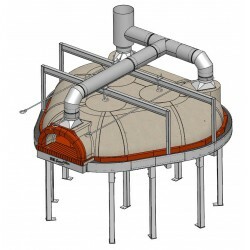 This design allows to get several dimensions and shape of ovens . Ovens are proposed with a vault made of refractory concrete (Chamotte) and only on request with a vault made of Bricks. Technical date is available under"download"
The door is 50 cm wide (we supply 50 and 60 cm wide doors on request with additional price.